PAIMI is DRW’s Protection and Advocacy for Individuals with Mental Illness program. 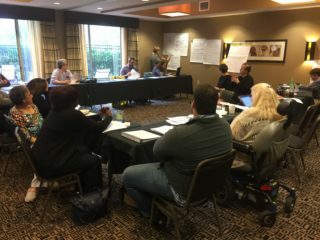 DRW’s PAIMI Advisory Council (PAC) works to protect the rights of children and adults with serious mental health conditions, and to advise the DRW staff and Board on priorities for our advocacy work. Council members are appointed for a two years term. They are asked to attend PAC meetings (at least three times a year) and to assist with outreach to educate the public about DRW’s services and to get input. Would you like to advise Disability Rights Wisconsin (DRW) on policies and priorities for our PAIMI program? Can you help educate the public about DRW’s purpose, priorities, and activities? If you have a commitment to improving mental health services, have a mental illness, are a family member of a person with mental illness, or are a professional or member of the public who has knowledge and interest in mental health issues, consider joining DRW’s PAIMI Advisory Council. Person who has received or is receiving mental health services or the family member of a person who has received or is receiving mental health services. Candidates who reflect Wisconsin’s racial and ethnic diversity. Candidates from Northern Wisconsin or other areas that currently represented. Interested? Please complete and submit the DRW PAC Application. If you have questions or to request an alternative format, contact Barbara Beckert at barbara.beckert@drwi.org or 414-773-4646.